Photograph of a Buddist sculpture slab, representing Mara's army taken in c.1883 and attributed to Henry Hardy Cole (probably incorrectly) . The exact location where it was found is unknown however it was near Peshawar in the North West Frontier Province. 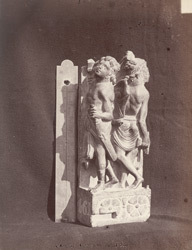 The slab is now in the Lahore Museum and captioned on the negative "Lahore Museum. [From] Eusofzai." Mara was an evil spirit who was scared that his power would be compromised if Buddha showed all how to attain enlightenment. The spirit therefore decided to distract Buddha from his life's work. Firstly he tried to tempt him with promises of power and pleasure. When this did not work he sent his forces, depicted in this sculpture, to frighten Buddha. His efforts were unsucessful however, Buddha was undettered. From the first and second centuries AD onwards, Peshawar in northern Pakistan was famous for it's sculptural traditions. Known as Gandhara, it was ruled by a dynasty of Chinese origin called the Kushans. They were Buddhists and under their rule, the religion and the arts associated with it were allowed to flourish. The reign of the Kushan king Kanishka, is particularly well known for its artstic achievements and it was during his reign, from 78 AD, that we find the first examples of the Graeco-Roman influenced Gandharan style of sculpture.